The Salvatanian- Church was finished in its today appearance in 1886. Its construction is related to a so called compressed, pre-romanic cell-basilica. Forerunners of the historistic church decrease up to the time of Charles the Great. It is believed the Salvatanian-church is the second oldest sacred building of town - after Aachen cathedral. 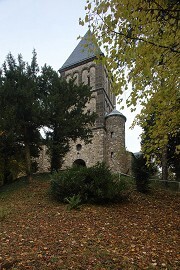 Comparable churches are the basic-church of Inda- Monastery in Kornelimünster and the so-called Einhard- Basilica in Michelstadt/Odenwald. Its pewage stood on low wood-platforms which have become rotten according to permanent humidity. They have been dismounted and the benches put in the two low-aisles. A soil survey showed the no-basement-church had no floor-plate but strip-footings, only. According to this the pewage-platforms stood more or less on pure ground, this might be an explication for its bad condition. 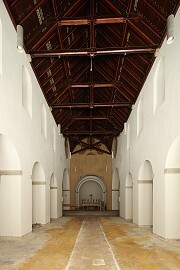 The nave's central corridor is completely separated from the building's other construction. It seems like an paved park-walkway. In 2013 the City of Aachen took over the church's authority from the diocese. According to this it is responsible of its preservation as well. 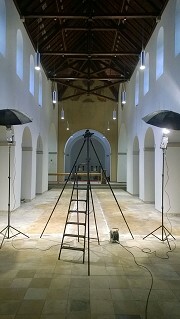 Before starting a present floor refurbishment I was engaged to document the present-situation by a vertical photogrammetric picture.